1. Tatcha Moisture Rich Silk Cream (c/o) - Surprisingly the name of this cream sounds a tad frightening to someone with oily skin, but this has become a great staple for me this winter. The texture feels like a gel but moisturizes like a cream, and unlike other ones leaves my skin matte which I simply love. Though I typically use in the evening, I have begun using for day when my skin is particularly dry and makeup wears beautifully over it. 2. L'Occitane Creme Divine - Richness personified. A delightful scent and buttery like texture makes this pleasurable to use, though I only need a small amount for my entire face. It does tend to make me a tad oily the next morning when I wake up, so I often need to balance it with a oil minimizing toner. For those with much drier skin, I think this would be an exceptional cream for the evening. 3. 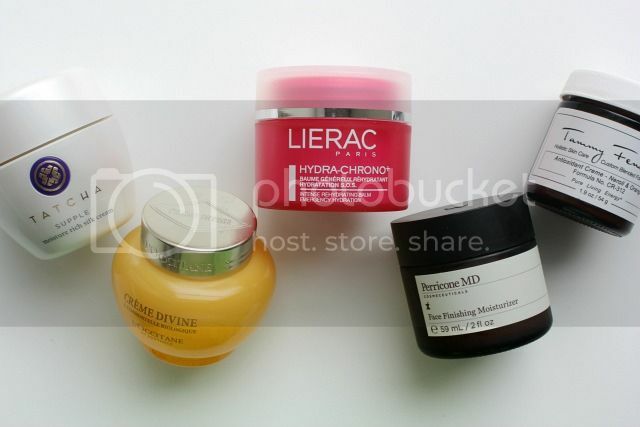 Lierac Hydro Chrono - Again, it is always a gamble when I try a product with "balm" in the description because it can be delightfully nourishing or way too heavy. This is an extremely unique texture that resembles both a gel and balm. For me, I found this worked wonders on those pesky dry patches I often got after trying to treat a blemish. Using acne products can be great at getting rid of my blemishes but can leave my skin dry and flaky occasionally, and a few dabs of this on those spots immediately banished any of that irritation. 4. Perricone MD Face Finishing Moisturizer (c/o) - I have three words to describe this moisturizer - Ah. May. Zing. I had high hopes for this one as the reviews were stellar to say the least, and I was relieved when the results matched my expectations. Moisturizing yet not too thick, rich yet not too heavy, it is just perfect. I prefer to use it at night but have found that my skin looks so smooth and supple the following morning - allowing for flawless makeup application. My only concern now is how many jars can I begin to stock pile? 5. Tammy Fender Antioxidant Creme Neroli and Orange - I began using this early last year and at first was quite impressed. The ingredients are designed to help soothe and nourish the skin, while also helping to balance overactive sebum glands. The soothing aspect was a definite plus and I continued to use when my skin was feeling exceptionally irritated or chafed from the cold weather, but sadly I did not see any reduction in oil production. In fact, I found that I was quite oily the following day unfortunately. From reviews that I have read, it may be more of a fit for drier skin types and those who prefer a more natural skincare range and ingredient composition.